12/23/2018 - Added Daikatana v1.3 link on Files page. Added aero1beta2, aero3beta1, deadsimple and dkdukehh7 maps by Dekonega. 01/30/2018 - Added the official Daikatana v1.0 Demo. 01/18/2015 - Daikatana v1.3 community patch is now available for public testing! Grab the latest builds here. 02/03/2014 - Added Wallpapers. Found the v1.1 US patch. 09/03/2011 - dotPlan Section. Read the development history of Daikatana through the words of the developers! 04/23/2011 - Added Planet Daikatana's Map Editing Tutorials, a new Misc Files section, cleaned-up some broken links. 04/15/2011 - Mirrored Soundtrack from DKNews (thanks Leo for links!). Added HQ Music Mod for Daikatana made by Poochyfud. 12/14/2010 - Servers page finally updated. Now using qTracker to dynamically update. 12/13/2010 - Wow, LONG time since this site has seen an update! The servers have been back for a while, and the Custom Maps has a totally new rotation just in time for the Holidays! New maps to download in the downloads section: Model Test Maps and Various HCI and Rex Maps. Grab the new maps, let me know what you think! 12/17/2007 - Cleaned up the Files section a bit, added more CFG files, Fixed GameTracker Servers Listing. Still have to sort through all the Demos. 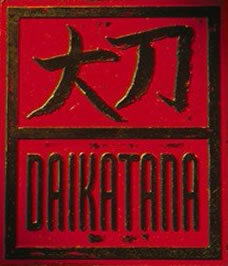 12/11/2007 - Rex, Stephen312312 and I had a pretty fun night playing Daikatana. We played quite a few custom maps. I added the demos to the demos section, be sure to check it out! 11/03/2007 - HUGE thanks to DI-Mammut for tons of Daikatana related files! Also, enjoy the Servers section ;). 10/30/2007 - Site is online and functioning. Still a while to go before it looks trulely presentable. In the mean time, enjoy the files!